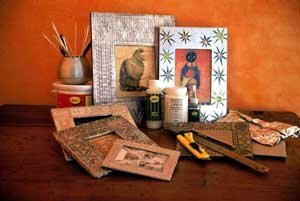 With this exciting project, you can create gorgeous frames using an old cardboard box, tinfoil, glass glaze, liner and few additional items! Cut three equal sized pieces of cardboard for the required frame. Use the construction glue to laminate two frame pieces together. This will be the front of the frame. Determine the size of the inner frame, relevant to the size of your design. Cut out this section. Using the pencil, draw the outer frame design onto the cardboard. Using the Podge (optional) or construction glue, apply one coat to both sizes of all the frame pieces. Allow to dry. This will seal the cardboard and prevent the frame from warping. Line your frame design with the glass glaze liner. Allow to dry for a couple of hours, depending on the weather. Using the sponge, apply two thin, even coats of stencil glue over the entire front (embossed part) of the frame. Use a sponge and not a paintbrush to apply the stencil glue. The paintbrush will create too much of a texture under the tinfoil. Stencil glue is easily removed from hands and other surfaces, using mentholated spirits. Cut a piece of tinfoil large enough to cover the front and back part of the frame. Using either the shiny or the matt side of the foil, position the embossed side of the frame onto the center of the tinfoil. Turn the frame over. Starting at the top of the frame using a soft cloth, gently rub, allowing the embossing to show through. Apply a coat of stencil glue to the cardboard on the back section of the embossed frame. Allow to dry. Fold over the excess tinfoil, to cover the back of the frame. To finish off the inside of the frame, use the craft knife and leaving a border of approx. 2 cm, cut out the inner square of foil. Fold over the approx. 2 cm excess foil to the back of the frame. Tear off any excess tinfoil. Using a kebab stick or knitting needle, GENTLY scratch around the embossed area, to highlight the design of the frame. The inner section of this part of the frame needs to be cut out 1 cm larger. Following the previous steps, cover the inner and outer section of back of the frame with foil. Once dry, laminate the two sections together. Cut the photocopy picture and the acetate to fit the larger cut out inner section of the frame. Your frame is now ready for either option 1 or 2. Option 1: To create an aged look, I used one coat of brown and then 1 coat of black shoe polish over the entire frame, working the polish into the embossed surface. Allow to dry and buff up with paper towel. I used a strong brew of rooibos tea to age the photocopy picture. Option2: I used Dala Glass Glaze to paint in sections of the frame. I used Dala Drawing Inks to colour the photocopy picture for my frame. Apply the hanger to the frame using the epoxy glue. This item has 872 views.